This is a real treat for fans of Chaplin and silent cinema more widely. All of Chaplin’s 35 films from his work at Keystone during 1914 have been reconstructed and restored by the British Film Institute and the Cineteca di Bologna. They will all be screened at the BFI Southbank in London during August and September. In the past these films have been branded as ‘primitive’, but in many cases the severely degraded quality of the prints worked against a proper appreciation of these early titles. The incredible popularity of these titles, as well as their lack of copyright, resulted in a heavy duplication and deterioration of the prints. In many cases the films were chopped into a variety of alternative versions with different titles which then went on to circulate for decades. This made the job of restoring and reconstructing these titles a particular challenge. Indeed the Keystone films are the last of Chaplin’s shorts to have been restored by the British Film Institute, following on from the Essanay and Mutual restorations. Keystone was known for its breakneck comedies featuring quick thrills and chaotic chases, and in many ways these titles live up to that reputation. But the Charlie you see here is not the sensitive soul found in his later feature films. Here is character is rude, abrasive and violent while his virtuoso performances are wild, thrilling and unexpected. Chaplin’s performance style is unique to him: he manages to be many things at once. Not only does his dandyish gestures contradict the state of his clothes, but his body can often belie his face and vice-versa. I was lucky enough to preview some of these restorations at the Charlie Chaplin Conference in 2005 and indeed they were revelatory. I will be attending every screening myself over the next two months (I will probably be the one taking notes) as a way of re-aquainting myself with these films. Not only do you get to watch the glorious Chaplin himself as vivid as ever on-screen, you get to witness his early development as performer and director. You also get to see a slice of American cinema history that instantly poses several overlapping questions: what was popular American cinema like in 1914? What were films by independent studios such as Keystone like? What was the studio brand and how do they differ from the films of the larger studios that would emerge just after the war? Why were these films, and more importantly Chaplin himself, so popular? How far were these films and Chaplin’s performances performed by the British music hall from which he came? 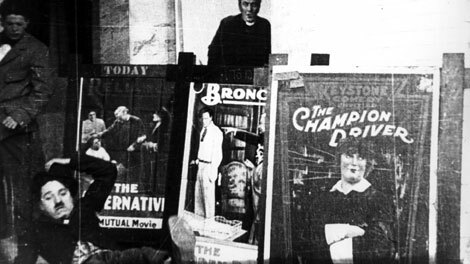 The still above from A Film Johnnie offers a glimpse of movie posters outside a cinema in 1914. Interestingly they feature films from the studios Keystone, Essanay (a Bronco Billy title) and Mutual, the three studios that Chaplin himself would work at between 1914 and 1917. Book below with the full schedule for August. The September schedule will follow. Ninety minutes of early Chaplin, including his Keystone debut. A programme of Charlie Chaplin’s Keystone shorts. Our third programme of Charlie Chaplin’s earliest films. Our fourth programme of the Keystone movies of 1914.